Thisstory was updated in 3:33 p.m. ET. CAPECANAVERAL, Fla. - The space shuttle Endeavour lit up the predawn sky aboveFlorida with a false sunrise early Monday as it soared into orbit like abrilliant, artificial star. Endeavourroared into space at 4:14 a.m. EST (0914 GMT) from a seaside pad here at NASA?sKennedy Space Center after a one-day delay due to low clouds. The launch wasexpected to be the last time a NASA shuttle blastedoff at night. ?Lookslike the weather came together tonight. The vehicle is in great shape and it?stime to go fly,? NASA launch director Mike Leinbach told the crewjust before liftoff. ?We wish you good luck, Godspeed, and we?ll see you backhere in about two weeks.? ?We?llsee yain a couple of weeks,? Endeavour commander Geoge Zamkaradioed back, thanking the launch team. ?It?s time to go fly.? ?Rogerthat. Have a great ride,? Leinbachsaid. 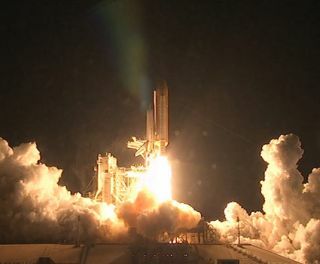 Itwas the 34th time a space shuttle has launched at night. All of NASA?s fourremaining launches are scheduled to lift off during daylight. NASA officialsestimated the number of spectators watching Endeavour?s blastoff in thethousands. Zamka and his five-man, one-woman crew willdeliver a brand-new room and an observation deck to the International SpaceStation during their planned 13-dayspaceflight. The shuttle will dock at the station on Wednesday morning at12:09 a.m. EST (0509 GMT). Themission is the first of NASA?s five final shuttle missions this year before thespace agency retires its aging orbiter fleet in the fall. Ridingaboard Endeavour with Zamkaare shuttle pilot Terry Virtsand mission specialists Robert Behnken, Kathryn Hire, Nick Patrick andStephen Robinson. With the exception of Virts ? who is makinghis first spaceflight ? all are spaceflight veterans. Theydid not get a chance to watch the Super Bowl 44 on Sunday, but the game wasbeamed to the space station for astronauts there to watch, NASA officials said.Former NFL linebacker Johnny Holland of the Green Bay Packers attendedEndeavour?s launch, they added. Theshuttle astronauts wore broad smiles as they trekked out to Endeavour beforelaunch. Onlookers shouted and cheered as they headed to the launch pad,calling, ?We love you!? and ?Have a great time!? At the launch pad, theastronauts made some last few phone calls and took photos before boardingEndeavour. Robinsonforgot his flight notebook when he went to the launch pad, but a NASA workermanaged to fetch it for him before he launched on the shuttle. Whilethey?re in space, Endeavour?s crew will be working on an overnight shift andsleeping during the day. The astronauts will go to sleep later this morning andwake up in the early evening to begin the second ?day? of their mission ? oneaimed at scanning their heat shield for damage. NASAspotted several pieces of foam insulation shed from Endeavour?s tank duringliftoff, but none appeared to hit the shuttle when they peeled off, missionmanagers said. Tonight?s inspection, as well as other surveys during themission, will help engineers determine the health of Endeavour?s heat shield. Endeavour?screw is delivering a new room called Tranquility and an observation dome calledtheCupola that is covered in windows. Three spacewalks and some tricky roboticarm acrobatics are on tap to install the new additions. ?Thisis a big construction mission,? Robinson said before launch. ?We?re going to goand add not just a new room on the house, but probably the most complex room onthe house.? Namedafter NASA?s historic Apollo 11 moon base, the Tranquility module is a 24-foot(7.3-meter) long cylinder that is nearly 15 feet (4.5 meters) wide and weighsabout 40,000 pounds (18,143 kg). The $382 million module will be the home forthe station?s life support, exercise and robotic arm control systems. TheCupola is a seven-window observation deck with a huge round central pane thatis the largest single window ever to fly in space. The $27.2 million portalwill be attached to an Earth-facing side of Tranquility and promises to giveastronauts on the station unparalleled views of their home planet and space. BothTranquility and the Cupola were built for NASA by the European Space Agency.Their delivery is NASA?s last big construction job for the space station, whichwill be about 98 percent complete once they?re installed. The$100 billion space station is the product of 16 different countries and hasbeen under construction since 1998. The new additions were built for NASA bythe European Space Agency. Endeavour?slaunch comes on the heels of last week?s announcement that NASA will cancel itsConstellationprogram responsible for replacing the shuttle fleet with new Orionspacecraft and Ares rockets. PresidentBarack Obama ordered NASA to scrap the program, which aimed to replace theshuttle fleet with new vehicles capable of launching astronauts to orbit andback to the moon, as part of the agency?s 2011 budget request. Thebudget request also included funding to extend the International Space Stationthrough at least 2020, support fundamental technology and science research andpromised $6 billion over the next five years to spur new commercial spacecraftto launch astronauts. Butshuttle managers described the reaction among NASA workers and engineers as oneof shock and angst. NASA chief Charles Bolden told reporters Saturday that hetook responsibility for thebacklash, and said he didn?t listen to advisors on how to prepare NASA?swork force and members of Congress for the news. ?Wasit screwed up? Yes, it was,? Bolden said, adding that he has a tough road aheadto meet with Congress to discuss the budget request. Several members ofCongress were on hand to watch Endeavour?s launch. Bolden,a retired Marine Corps general and former space shuttle commander, alsoreminded reporters and the public that NASA only has five more shuttle missions? including this one ? before shutting down the program. Heurged journalists and the members of the public watching Endeavour?s launch tosoak in the moment, because NASA?s shuttle era will soon be over. Endeavour?sflight, for example, is due to land on Feb. 20. ?You?regoing to have to figure out what else you?re going to do along with the rest ofus,? Bolden said.